Can your dog shake paws on cue? Shake is a fun dog trick that's fairly easy to teach dogs and most can learn it quickly. After just a few short training sessions your dog will be offering its paw for a shake every time they meet someone new. The only things needed when training a dog to shake paws is your dog and a handful of treats. If you are clicker training, you will need your clicker as well. This trick relies on the dog sitting calmly and giving you its undivided attention. If it doesn't know how to sit reliably, go back and practice that command before moving on. Have your dog sit. Hold a treat in one hand and show it to your dog. Close your fist over the treat so the dog can't get it. Give your dog the command "shake," and wave your closed fist under its nose to keep it interested in the treat. Wait for your dog to start digging in your hand for the treat. Usually, dogs sniff around, and when that doesn't work they begin to paw at your hand. The moment your dog touches your hand with its paw, say "good" or click your clicker. Open your hand and allow the dog to have the treat. Practice "shake" for five minutes, two or three times a day. Your dog will be offering you its paw the moment you give the command before you know it. Once your dog is offering its paw on command, you can begin phasing out the need to hold the treat in your closed hand. Start with your hand closed over the treat, and give your dog the command "shake." As soon as it offers a paw, give it a treat from your other hand rather than the one closed in your fist. Repeat this several times. Next, put out your hand without holding the treat inside and give the command "shake." Give your dog a treat from your other hand as soon as you're offered the paw. Practice this step over several training sessions. If your dog seems confused at any point, go back a step or two in your training. Now you are ready to phase out the treat almost entirely. Begin by offering a treat less frequently, first by giving your dog a treat after every other time it offers a paw on command. Slowly decrease the number of times your dog gets a treat. Soon your dog will be offering the paw on command and you will only need to give an occasional dog treat to reinforce the behavior. One common problem is the dog who doesn't put its paw on your hand, no matter how long you try to entice it with the treat. 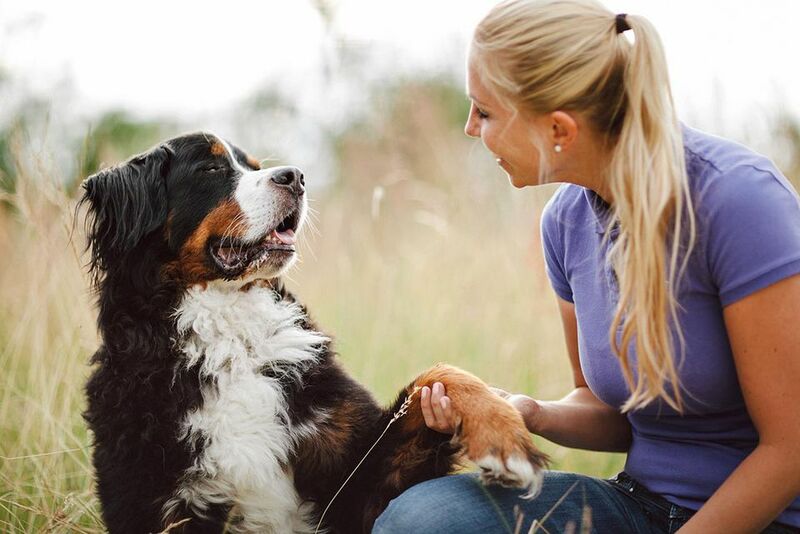 In this instance, move the hand holding the treat closer to your dog's paw. You can even give the leg or paw a little nudge. As soon as the dog raises its paw to your hand, give it the treat and say "good" or click. If your dog still doesn't understand what is expected of it after you nudge the paw, you can try lifting the paw into your hand yourself. Give the command "shake," reach down and pick up the paw, and then tell the dog "good" or click your clicker and offer the treat. Repeat this quickly several times in a row, giving the dog a treat each time, and then go back and start off from the first step above. Most dogs will now understand what is expected and begin to offer their paw. Remember to be patient and keep training sessions short. If your dog becomes frustrated or bored, it's time to finish up the session. Always try to end on a positive note, even if it means asking your dog to do something simple, like sit. When your dog is regularly shaking with you, it's time to proof the behavior. The best way to do this is to have another person ask your dog to shake. The more familiar your dog is with the person, the easier it will be. Demonstrate your approach with your dog first, so the person can mimic you as closely as possible. Then, let that person sit the dog down and ask for a shake. Try this with a few people and your dog will understand that people love to shake paws!